County of Worcester: Bockleton, Eastham, Hanley Child, Hanley William, Knighton-on-Teme with Newnham, Great Kyre [Kyre Magna], Little Kyre [Kyre Parva], Lindridge, Orleton, Tenbury (3). County of Salop: Burford (2), Burraston and Watmore, Nash Weston and Tilsop, Greet, Whitton. County of Hereford: Brimfield, Little Hereford and Upton, Rochford, Stoke Bliss. In addition, there were four ex officio Guardians. The population falling within the Union at the 1831 census had been 7,109 with parishes ranging in size from Whitton (population 76) to Tenbury itself (1,768). The average annual poor-rate expenditure for the period 1834-36 had been £2,945 or 8s.3d. per head. The Guardians held their first meeting on 29th August, 1836, at the National School. Sir Christopher Smith was elected chairman, and the Revd. C Turner as vice-chairman. William Trumper was appointed clerk at a salary of £60 per annum, and instructed to advertise for a treasurer, relieving officers and "medical gentlemen". A sub-committee was appointed to pursue the construction of a workhouse. Mr H Whittal of the Ludlow branch on the Commercial Bank of England was subsequently appointed as Union Treasurer. Samuel Collins of Burford and Thomas Oseland were appointed relieving officers for the Unions two sub-districts at salaries of £45 per annum. Mr Cook and Mr Davies were appointed medical officers at £70 and £60 per annum respectively. Sites at Oldwood Common and the brickyard in Burford were considered as potential workhouse locations. The site eventually chosen was on Teme Street at the south side of the river bridge in Tenbury Wells which was offered as a gift by Mr George Rushout Bowles. The new Tenbury Union workhouse was erected between April and December 1837 at a cost of £1,200, plus a further £165 for fitting out. The cost was mostly met by raising loans from local people at 5% interest. 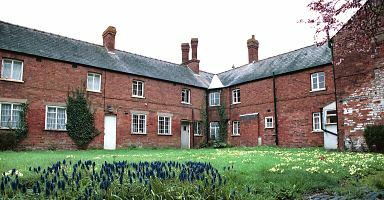 The architect was George Wilkinson who designed a large number of other Union workhouses, although Tenbury was his only one to be built in Worcestershire. Tenbury was also Wilkinson's only design based on a double courtyard plan. The building's location and layout are shown on the 1902 map below. The building could accommodate up to 70 inmates, although was rarely more than half full. At the front of the building, the Guardians' board-room lay at the centre, with the kitchen and dining-hall to the rear, dividing the female side at the west from the male side at the east. Tramp wards lay at the south of the site. 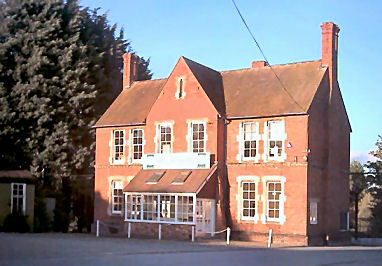 Tenbury entrance block from the south-west, 2001. Tenbury from the north-east, 2001. At the east of the site lay an infirmary and a separate isolation block constructed from corrugated iron. 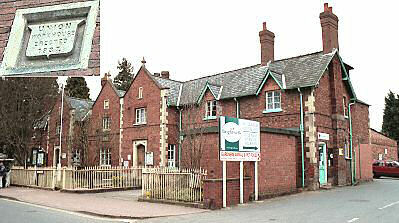 Tenbury infirmary from the west, 2005. The work provided for the male inmates included breaking up Clee Hill stone for use in road making, and sawing up railway sleepers for firewood. Vagrants entering the tramps' wards had to remove the rags from their feet and use the footbath set into the floor. In 1854, the board-room was being used to hold County Court and Petty Sessions. Magistrate courts were later held there, and after its creation in 1894, the Tenbury Rural District Council also used the board-room. In 1937, the former workhouse building became the home of the local council offices and fire-station. The main building was used until recently as council offices but the is currently in the throes of redevelopment, possibly for refurbishment as offices. 1881 Census - Tenbury workhouse. Worcestershire Archive and Archaeology Service, The Hive, Sawmill Walk, The Butts, Worcester, WR1 3PB. Relatively few records survive — holdings include: Guardians' minute books (1836-1930); Births (1927-30); Deaths (1866-1914, 1927-30); Register of inmates (1930); etc.